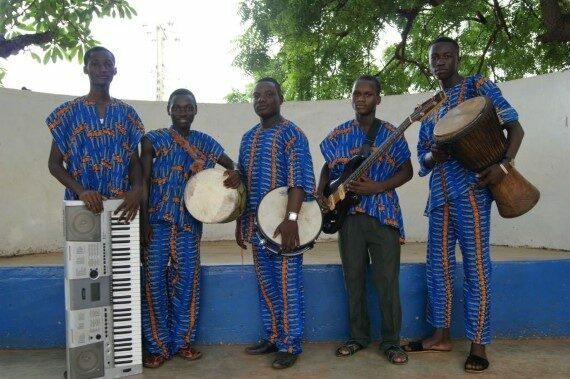 The late sunday afternoon heat is quite bearable as a gentle breeze flows in subtle succession through centenarian nim trees that dot the Youth Home Centre in the Northern regional capital, Tamale. 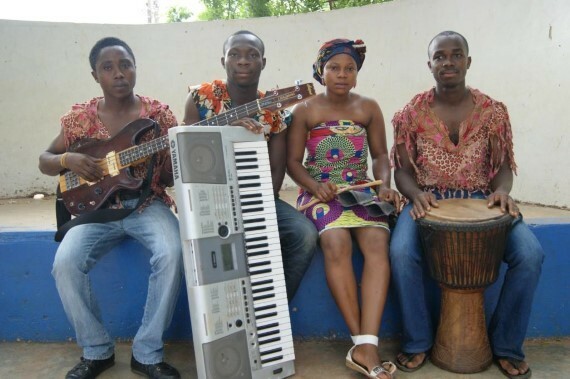 Five young bands go through sound check formalities as they prepare for the 2014 edition of New Music Ghana Festival – a competition that is dedicated to the empowering of youthful artistes throughout Ghana. 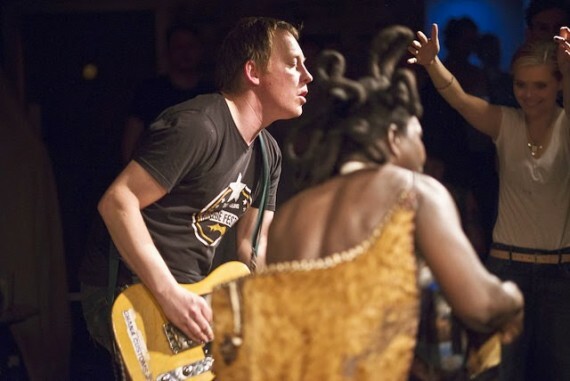 Comprising young musicians under the age of 25, some of whom have never been on stage, they appear nervous as they emerge from makeshift dressing rooms to a worn-out basketball court that served as a performance venue. 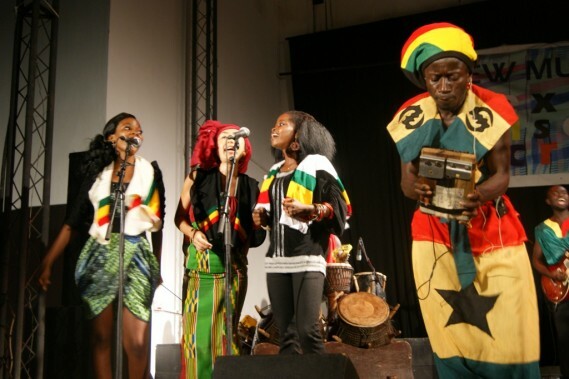 Five groups – namely Bizung School, Yurlim, North Wings, Suhuyini and Young Echoes Bands, who have been rehearsing over the past few months, perform a cool blend of rhythms from Northern / Southern Ghana with western rhythms as they woo both the audience and jury members. 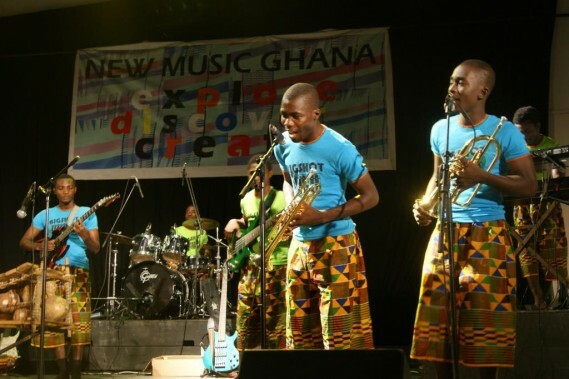 North Wings Band, led by Frank Elinam emerge as the first group with a dramatic fusion of Bamaya, Gahu and Agbadza with jazz to create a new music synthesis that drew wild cheers from the audience, which encompassed several music lovers from Accra and tourists. 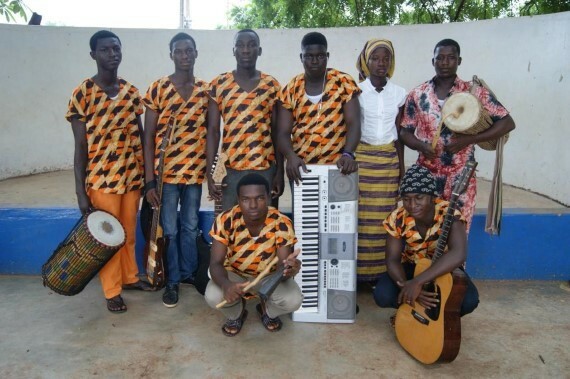 Suhuyini, Yurlim, Young Echoes and Bizung School Band, who took the second, third, fourth and fifth positions respectively, received cash prizes totaling Ghc 3,000.00 alongside the winning group for their dedication in employing the use of local musical resources in their compositions. 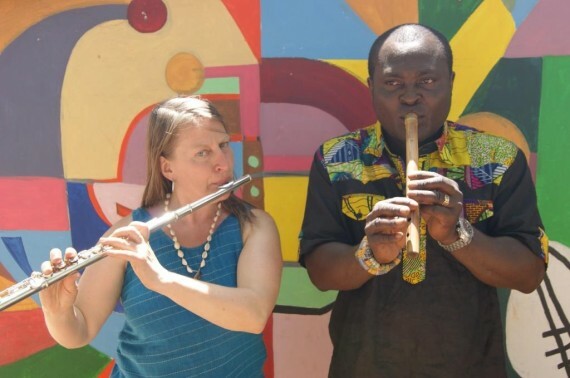 Earlier, flute dynamo Dela Botri held an improvisation and composition workshop for all participating artistes while MUSIGA Northern regional director BA Konlaan gave a lecture on effective lyrics. 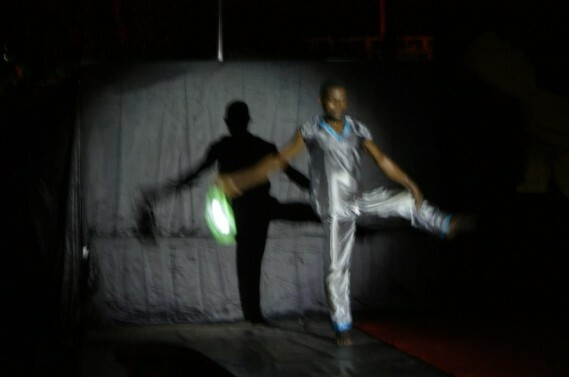 Dance director Abdul Rahaman Mohammed equally took on the use of traditional dance on stage by musicians. 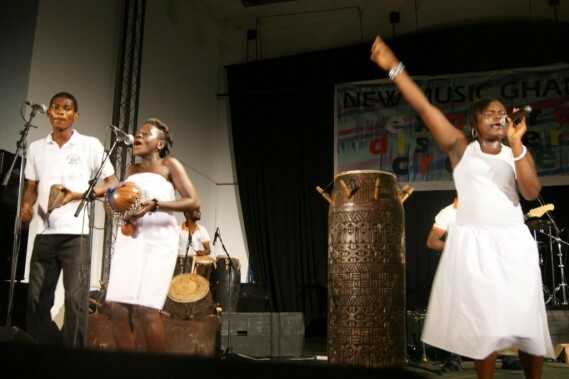 Korkor Amarteifio, Director of New Music Ghana Festival, moderated a round table discussion of the effective strategies to employ in the quest to embolden and support young artistes in Northern Ghana. 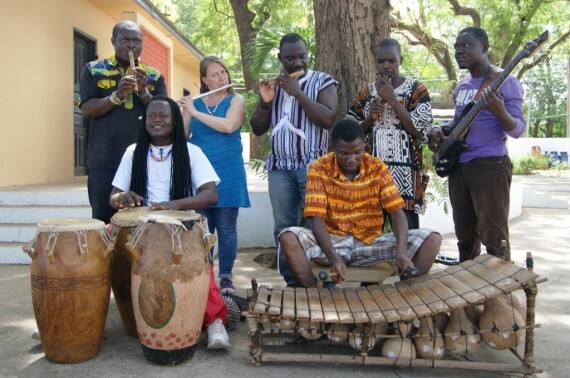 Undeniably, the seeds of full-blown inventive musical creations in Ghana are being sown in the savannah highlands of Northern Ghana through this vibrant, radiant and transformative musical experience. 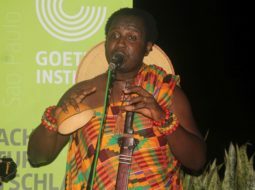 Goethe-Institut in Accra and the Ghana chapter of Arterial Network supported New Music Ghana 2014, which was organized by the Institute Music and Development. 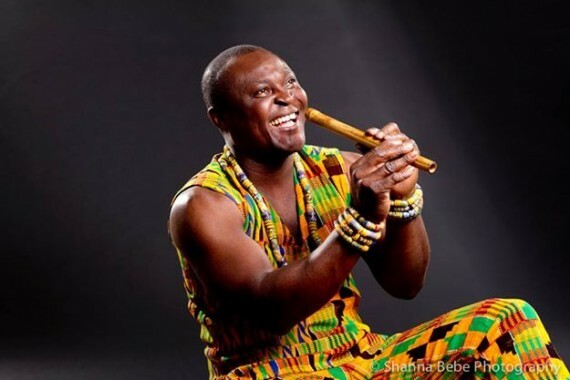 Ghanaian flute virtuoso, Dela Botri alongside a 14-piece band and hiplife star Klala, recently launched “Naa Ayele”, a ten-track album with a concert at the Alliance Française in Accra. 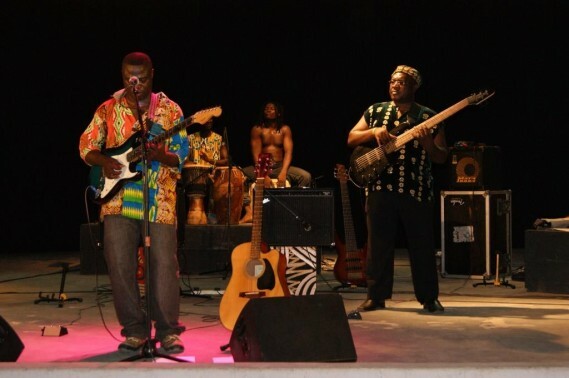 “Naa Ayele”, which is the 4th album by Botri, is a vibrant fusion of zouk, salsa and contemporary highlife/kpanlogo rhythms. Indeed, it forcefully reveals the hidden richness of Botri’s neo traditional compositions, which has enchanted audiences all over the world. 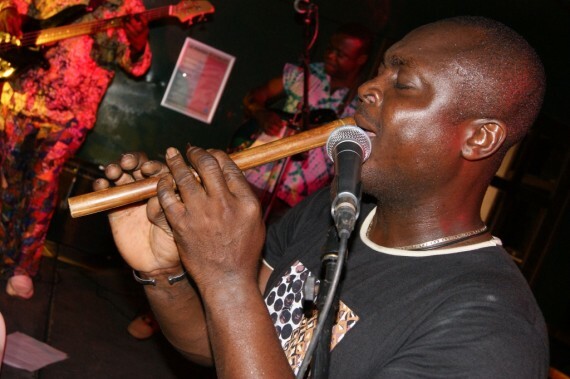 The album prominently features the atenteben, a bamboo flute that amazingly harmonizes with all the western instruments employed for the album. 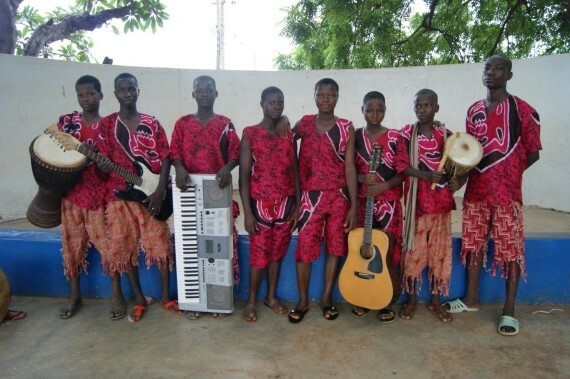 These include keyboards, trumpets, trombones, saxophones and acoustic/electronic guitars. 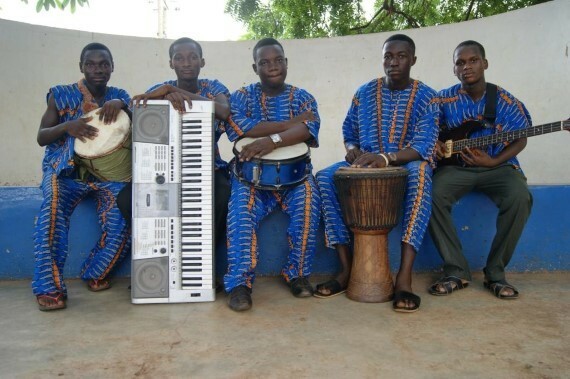 Accompanied by lyrics heavily lined with social messages, “Naa Ayele”, which uncovers the compositional skills of Botri, is definitely on the contemporary/modern tip but has its heart firmly embedded in the elements of traditional music. 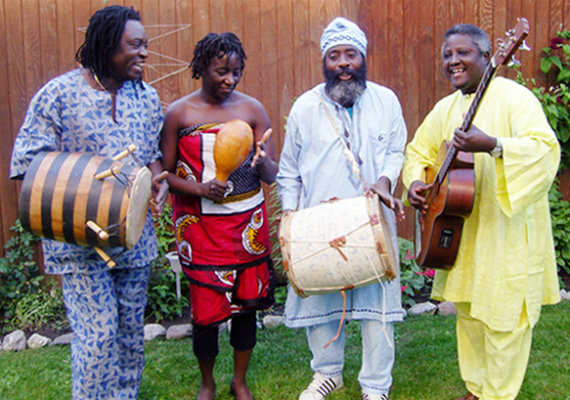 With songs in Ga, Ewe, Twi and English, the album equally shows the ability of Botri to fuse various rhythms in high scales and notes resulting in compositions that reveal the beauty of blending cross-cultural rhythms. A devotee of contemporary music, Botri has held workshops in a number of universities and performed to varied audiences in the Middle East, Europe, USA and several countries in Africa. 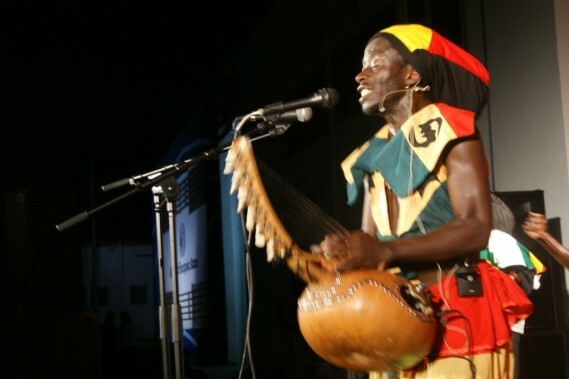 Last month, he performed with the acclaimed Malian balafon player Keletigui Diabate in Accra. 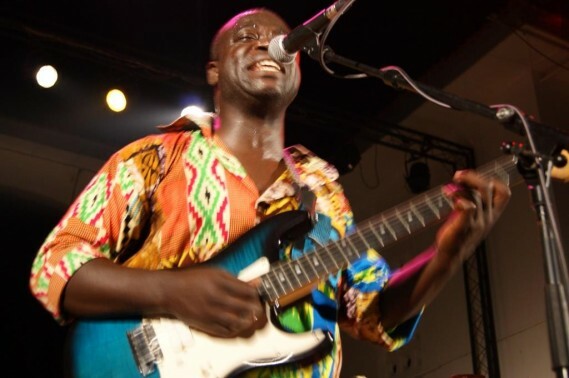 In recent years, he has participated in the Cubadisco Festival (Cuba), World Music Village (Finland) and Pan African Music Festival (Algeria). 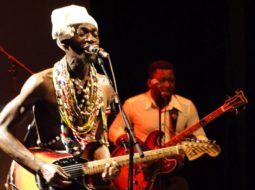 He also joined Liberian star Miatah Fanbulleh to perform at the 2011 Novel Peace Prize Awards in the Norwegian capital, Oslo. 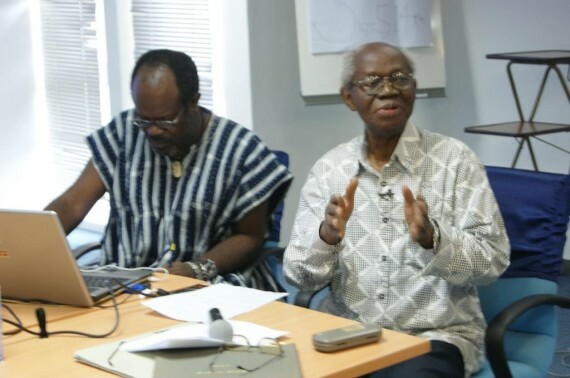 Renowned ethnomusicologist, Emeritus Prof. J.H. 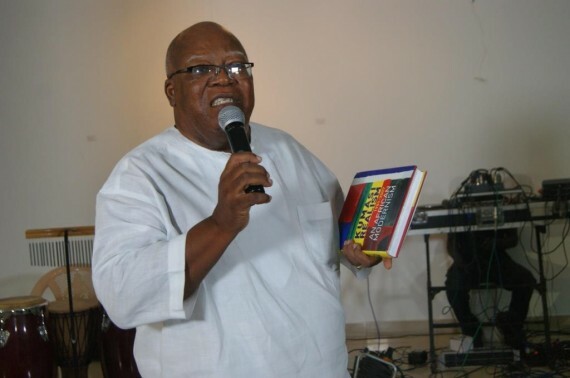 Kwabena Nketia, who has mentored and followed the works of Botri over the past decade, was the special guest of honour with Peace FM’s morning show host, Kwame Sefa Kayi as MC. 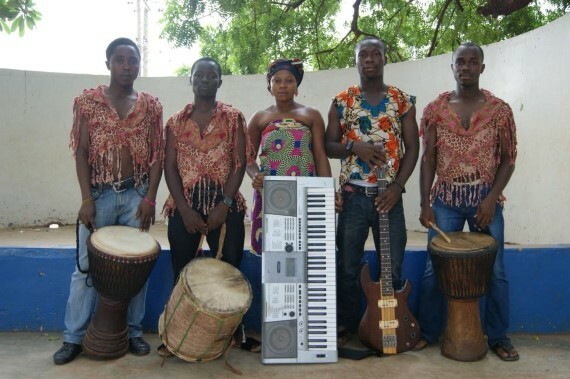 “Naa Ayele” was recorded at Atenteben Studios and mastered at Freddima Studios in Accra. 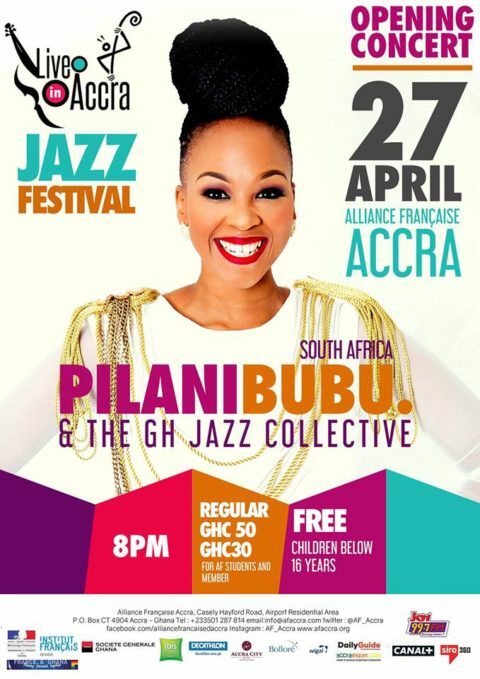 The launch/concert is being sponsored by Institut Francais, Alliance Française, Kosmog Collections and Woodin. 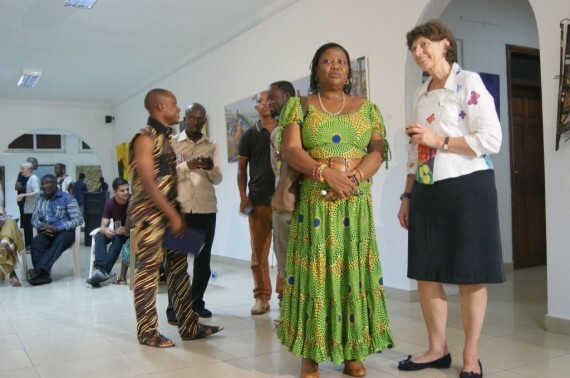 The Ghana Denmark Cultural Fund (GDCF) has approved GHc 259,622.55 for eight arts organizations, associations, groups and individual artists for a variety of arts projects. 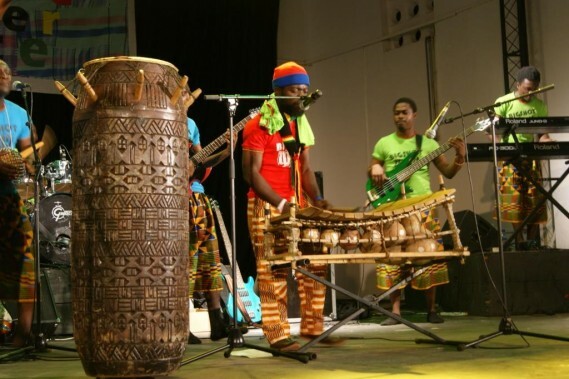 Successful applicants are Afro Maestros Band, Dwenesie Music Institute, Centre for National Culture (Tamale), National Commission on Culture (Accra), La Akaibi Group, Rev. 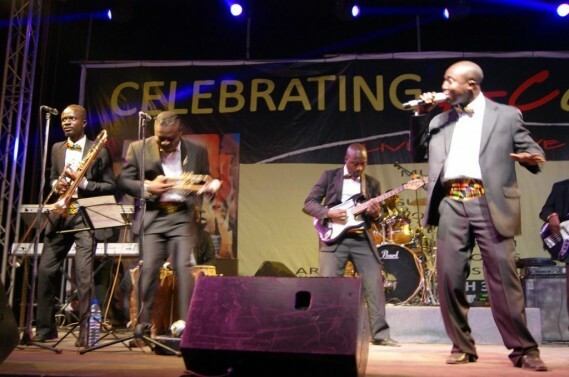 Dr. Elias Asiama, Allotey Bruce Konuah and Isaac Opuni Frimpong. 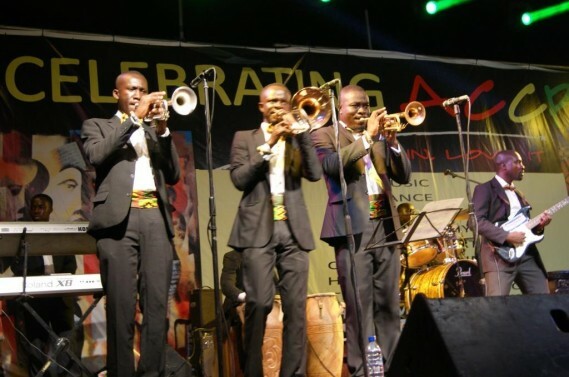 This follows recommendations made by a peer review committee set up by the Institute for Music and Development (administrators of the fund) to vet applications from various parts of the country and make recommendations to the board of GDCF. 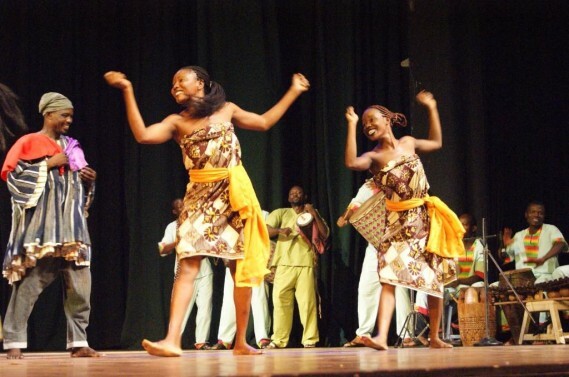 Projects to be executed under the grants include purchase of musical instruments, notation of classic highlife tunes, creation of a moving image archive, drama festival for schools, sensitizing the public on Ga culture, story-telling festival, seminar on women leadership, websites and blocs for photographs and tourism among others. 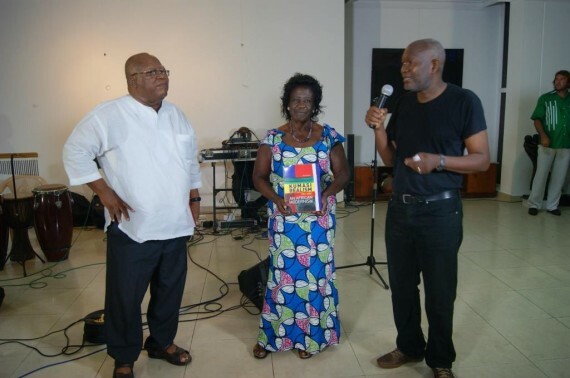 GDCF board members comprise Mille Sofie Brandrup (First Secretary / Political Officer, Royal Danish Embassy in Accra), Prof. Irene Odotei (Director, Historical Society of Ghana) and Dr. Agyemang Osei (School of Performing Arts, University of Ghana). 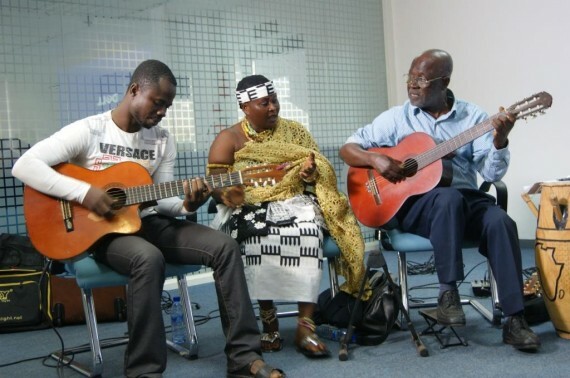 Others are William Attipoe (Director of Finance & Administration, National Commission on Culture), Oh Nii Sowah (Lecturer, Dept. 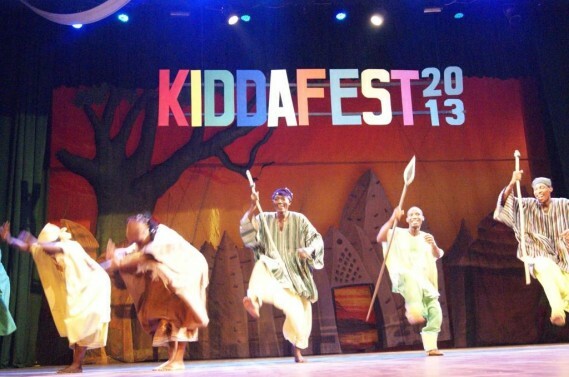 of Dance Studies, University of Ghana, Legon) and Akoss Ofori Mensah (Director, Sub Saharan Publishers). 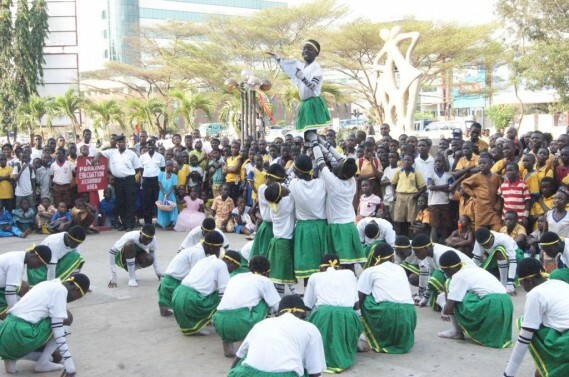 Since 2012, when the GDCF commenced its second phase, it has released a total of GHc 987,622.55 for various arts projects throughout the country. 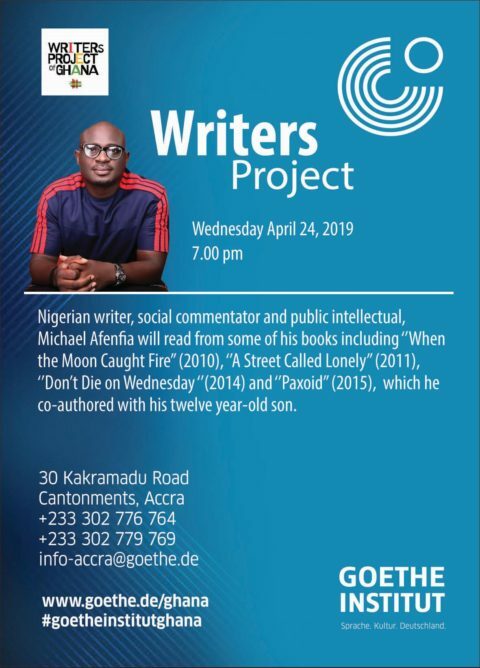 These include publishing of books, documentary films, dance productions, acquisition of instruments / equipment, story telling and reading programmes for school kids among others. 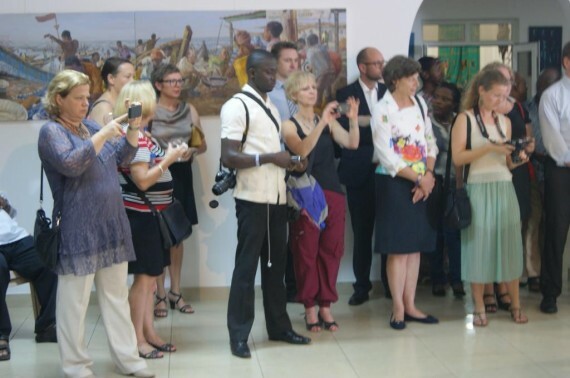 The GDCF, which was set up in 2007, focuses on Ghana/Danish art/cultural exchanges while enhancing the work of Ghanaian artists and art professionals with emphasis on contemporary ideas based on Ghana’s rich cultural and traditional practices. 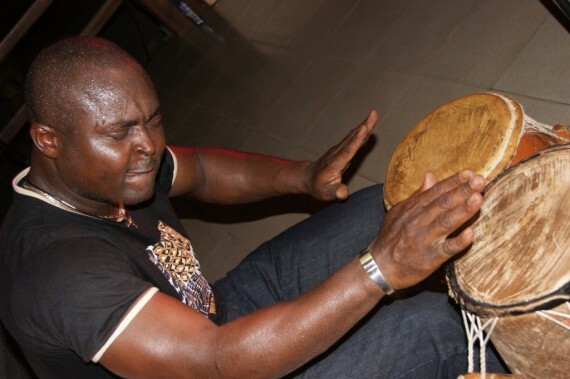 Ayi Solomon, a percussionist from Ghana was born in 1956 and raised at Mamprobi, a suburb of Accra. 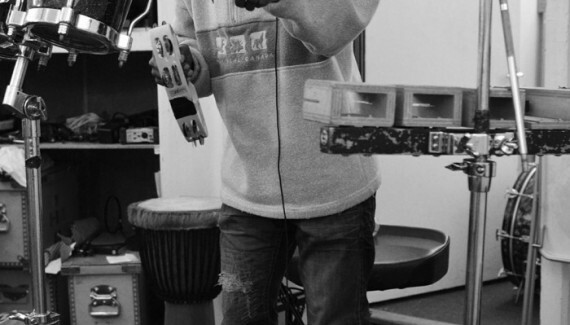 He is a self taught musician and composer. 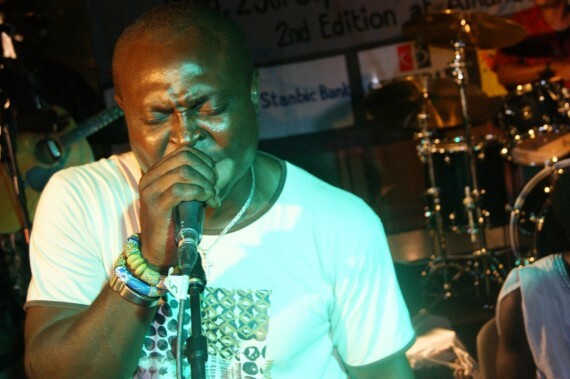 He started his musical carrier as a drummer in the erstwhile Ghanaian reggae group Classic Handles that later became The Classic Vibes. 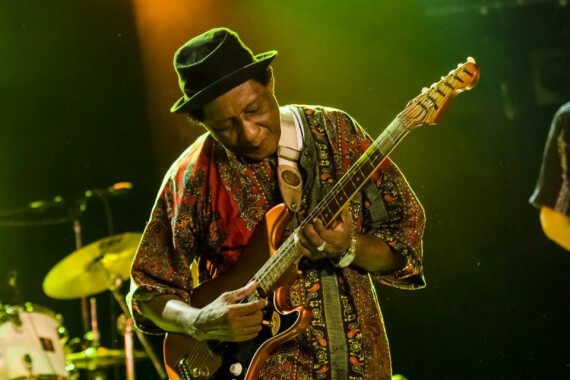 In 1982, Ayi Solomon came to Copenhagen with the Classique Vibes to participate in the Annual Afro Festival, organised then, by Denmark based Ghanaian, Kwabena Manu. At the end of the festival he went to Germany with Classique Vibes under a one-year management contract playing in American and German clubs. The following year he returned with the band touring Scandinavia. 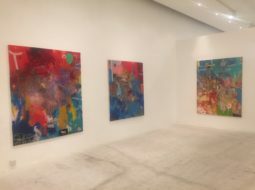 However, inspired by the new environment and the different musical of styles, he decided to stay in Copenhagen after the tour, to work with different musicians in Denmark. 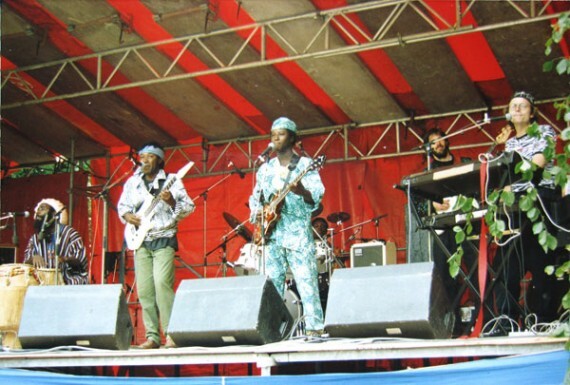 Eventually, Ayi Solomon joined the Danish group, The NEW JUNGLE ORCHESTRA, led by Pierre Doerge. 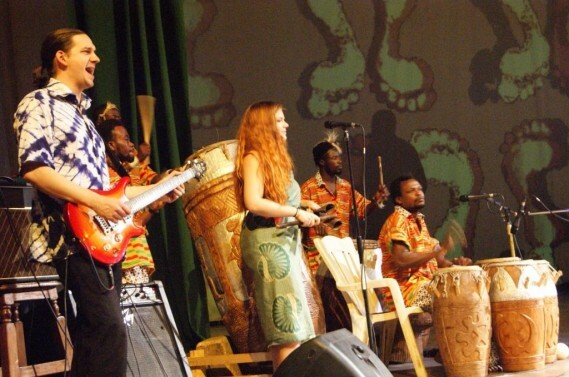 Solo, as he is affectionately called in Denmark, has remained a member of this group for nearly two decades. 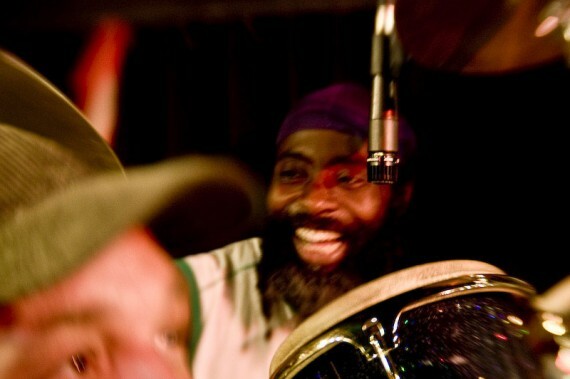 Ayi Solomon is a well sought after percussionist in Denmark and list of groups he plays in, is endless. 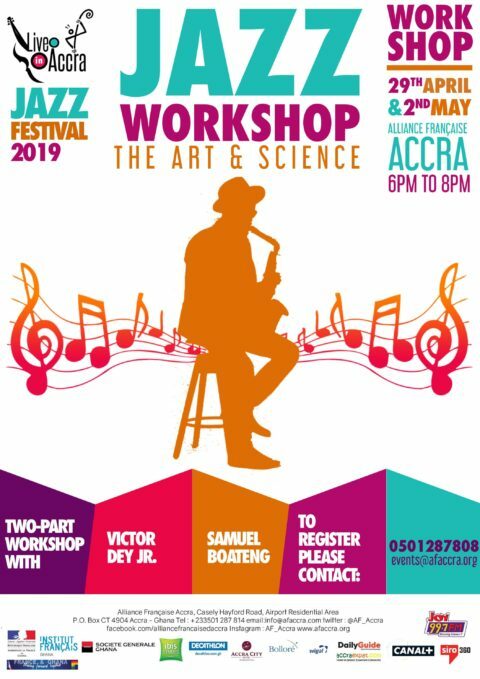 Today, he is working and playing with the following groups and musicians: Danish-Malian basist, Moussa Diallo, Palle Mikkelborg, Simon Spang Hansen, Dalia Faitelson’s Global Sound in 2001, with Jerry Bergonzi, Randy Brecker, Adam Nussbaum, Chris Cheek, Lelo Nika, & Thommy Anderson. 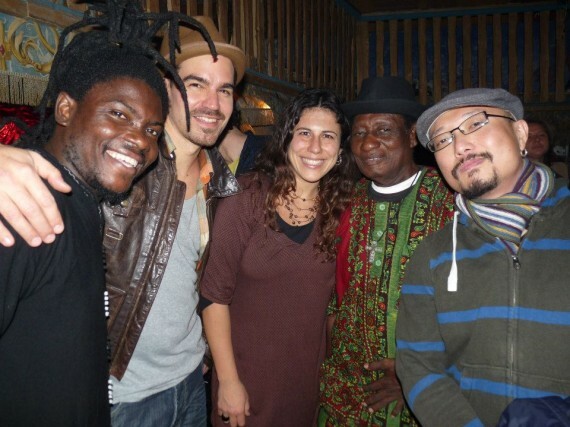 Others are John Sund’s Special Venture/ Acoustic Sense – “World/Fusion,” Hugo Rasmussen, Susy Hyldgaard, Mikkel Nordsø, Klaus Menzer, Jakob Fischer, Uno Mundo – Latin Reggae, Michel Nielsen’s Fulani, Morten Groenvad, Jakob Andersen, John Tchicai, Somalian singer Marian Mursal, Benjamin Koppel, Ed Epstein among others. 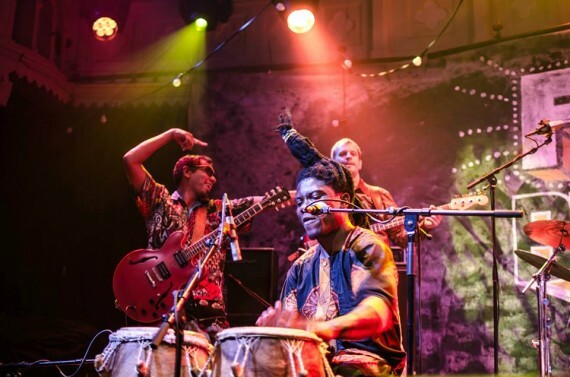 Presently, he is working with the Danish Folk Band Himmerland which is taking him around the world, playing gigs Australia, New Zealand, Russia, Chile, Bulgaria, Italy, and Scotland to mention a few. He has two albums to his credit. The first one ”BACK HOME” his debut CD, is released on Cope Records (Denmark). 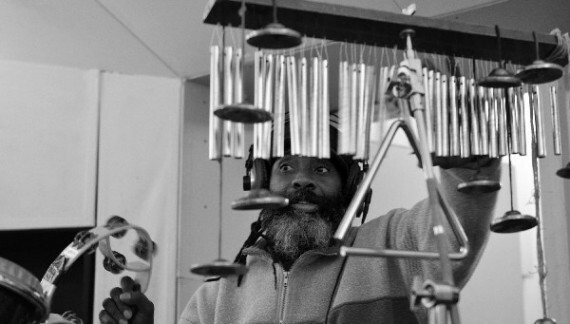 Majority of the compositions are Solomon’s, and besides being featured as a percussionist he also handles the vocals. 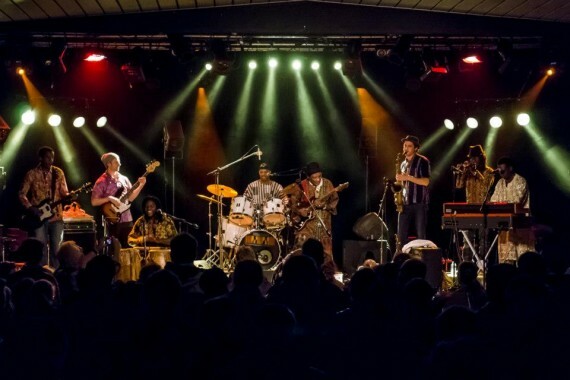 The music, which is hard to put a label on, can best be described as a fusion between African (modern and roots), jazz, pop, rap and funk with a spice of electronic additions. 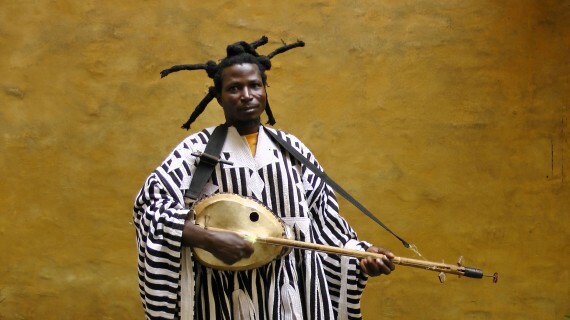 His second album, “Life Force”, portraits Ayi Solomon as a creative, enlightened musician with a broad vision of the kind of sound he meditates on. Life Force released on Yisol Music, his own label, is a piece of work of an inspired master, accompanied by a group of talented musicians. 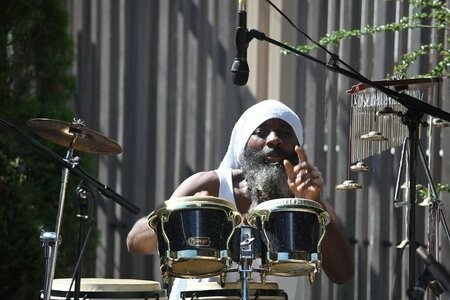 Here, Ayi Solomon in a high spiritual bliss, expressed through his invigorating drums, chanting and compassionate singing. “I believe, the world today needs to hear voices and compositions of dedicated artists like myself – a musician and a great humanist with a profound philosophy of life”. “Life Force is a music of celebration, joy, meditation and ecstasy. Indeed, it is a tour-de-force of a deep ocean of melodies and soul awakening beats”, he explains. 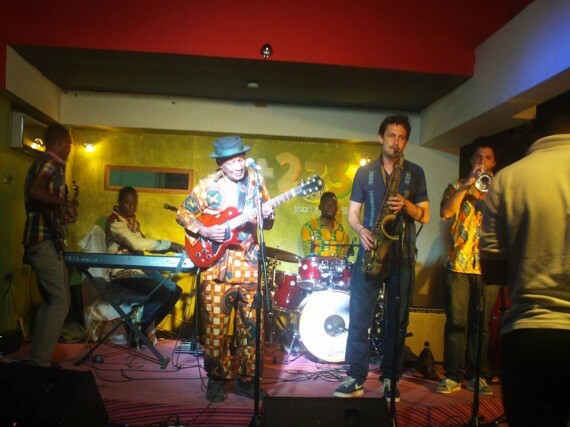 Ayi Solomon is a composer with that sophisticated taste for universal elements – mixing jazz, highlife, funk, Latin and traditional Ghanaian rythms. 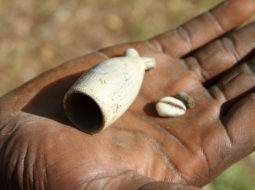 With this exclusive blend of rhythms, Life Force becomes a delightful creation of world-fusion. To music lovers Life Force is a precious gift. The afternoon breeze inertly shifts the leaves on the numerous trees at the British Council in Accra as we await a lecture by the acclaimed ethnomusicologist Prof JH Kwabena Nketia. 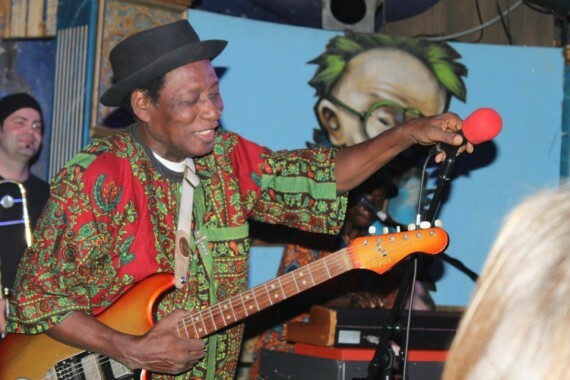 As the audience builds up for a lecture on the “Transformation of Ghana’s Traditional Music” my mind is focused on the Ghanaian music legend Ebo Taylor, who is scheduled for an hour-long chat with me at the same venue. 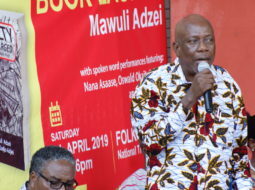 Frustrated drivers trapped in a slow moving traffic in front of the British Council angrily toot their horns as Taylor walks in creating in the process some sort of “history” – three living legends under one roof – Egya Koo Nimo, Prof Nketia and Taylor. Our chat begins almost immediately. 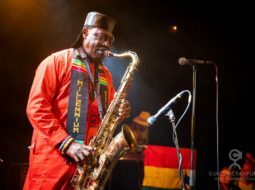 “It is my effective use of Afro Beat and Highlife alongside strong jazz elements that rekindled the interest in my music throughout the world – indeed, it has been a live long ambition to develop Highlife”, says Taylor, who has in recent years being a regular feature in major music and arts festivals all over Europe. 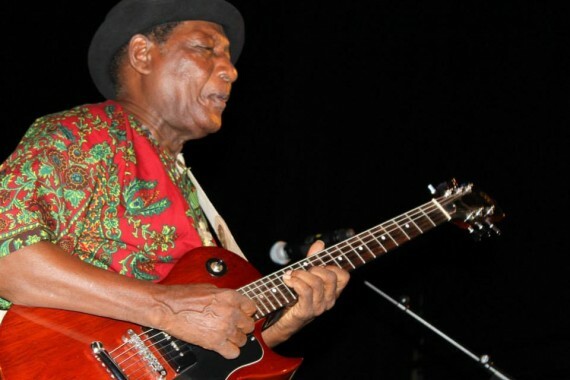 Taylor, who is a guitarist, composer, arranger and producer, has been a fundamental influence on the Ghanaian music scene over sixty years. 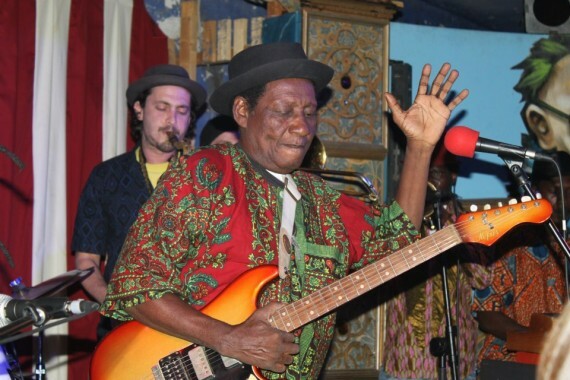 Undeniably, he was a significant force of Highlife bands in the 1960s. 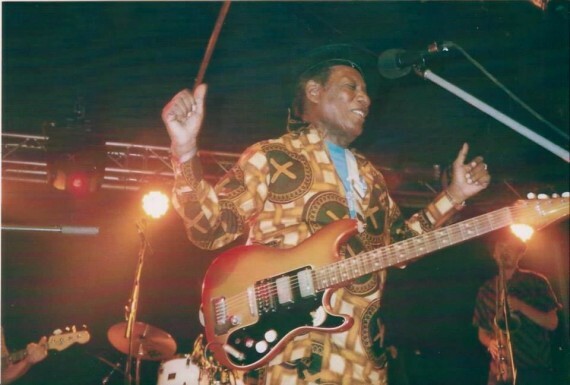 In 1962, he took his own group, the Black Star Highlife Band to London (UK), which led to collaborations with the late Afro Beat King, Fela Anikulapo Kuti. 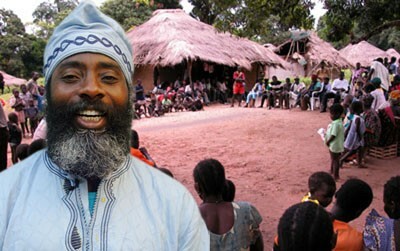 Returning to Ghana, he worked as a producer, crafting recordings for Pat Thomas, C.K. 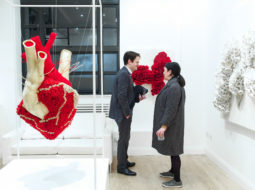 Mann and others. 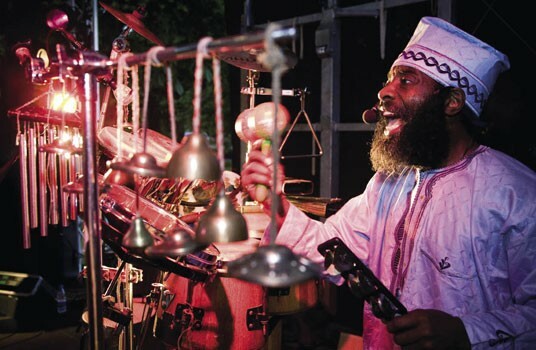 He found time to explore his own projects, combining traditional Ghanaian material with Afro-beat, jazz, and funk rhythms to create his own recognizable sound in the 1970s. “Taylor’s work became popular internationally with the release of “Love and Death” on Strut Records in 2010, which is without doubt his first globally distributed album. Its apparent success encouraged Strut to release the all-star retrospective Life Stories: “Highlife & Afro Beat Classics” (1973-1980) in 2011. 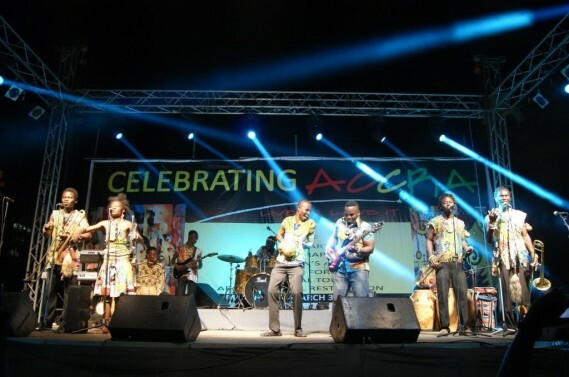 “Education is the key for young Ghanaian musicians – they need to educate themselves, conduct research, use local material in their compositions and the sky will be their limit because Ghanaian music is in demand all over the world”, adds Taylor, who received a meritorious award from the Navarro Jazz Festival (Italy) in 2012. 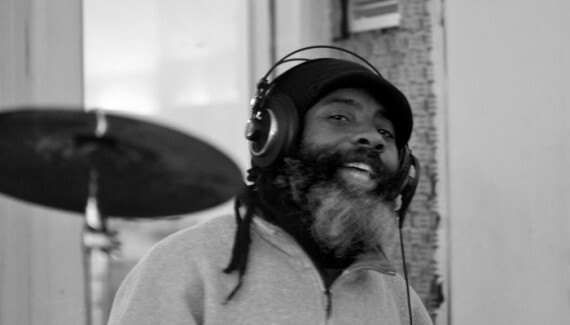 Later in 2012, a deeply personal album titled “Appia Kwa Bridge”, appeared and proved the fact that at a “ripe” age of 77 – Taylor is still intensely creative and focused – mixing traditional Fante songs and chants with children’s rhymes and personal matters into his own satirical visualization of highlife. 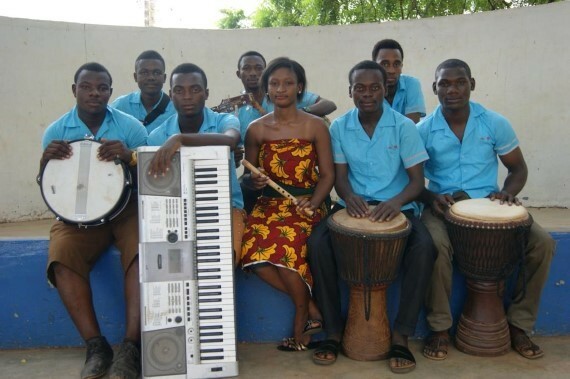 A graduate of Eric Guilder School of Music (London, United Kingdom), Taylor vigorously advocates the return of music to school curricula in Ghana since its absence has contributed to the gradual but steady decline of the quality of music being produced in the country. 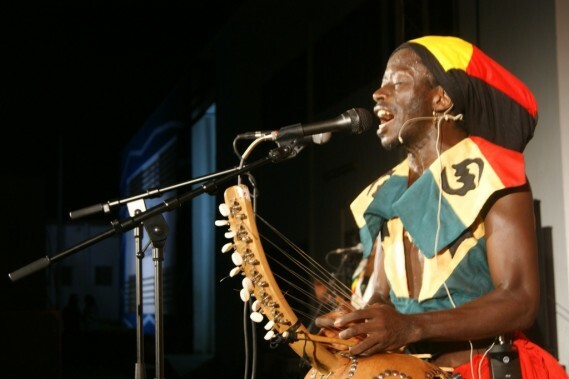 Barely forty-five minutes into our chat – the living legend needs to leave – he is catching a flight at the Accra International Airport for yet another performance tour of Europe. As he settled in a waiting car he gives me a thumps up – I equally raise both thumps in return. 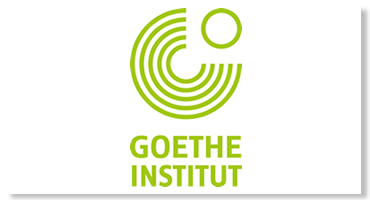 Two dancers lay motionless on the immaculate carpet at the Goethe-Institut in Accra – they move in absolute unison as they calmly yet fiercely showcase the beauty of physically challenged and able-bodied artistes working in harmony. 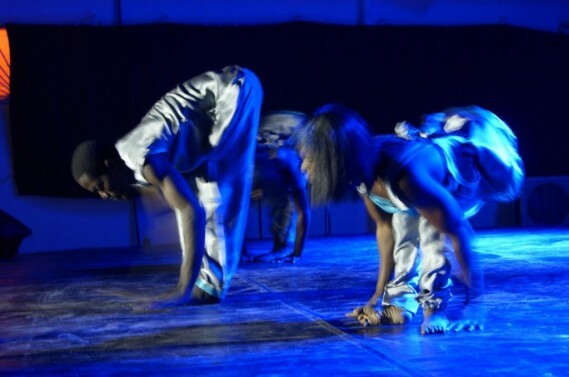 It’s a performance of “Nkabom” (Unity), a 55 minute piece that ended the month long Celebrating Accra Arts Festival (CAAF) – and the group on stage is Dance Factory – undoubtedly the leading mixed able dance company in Ghana. 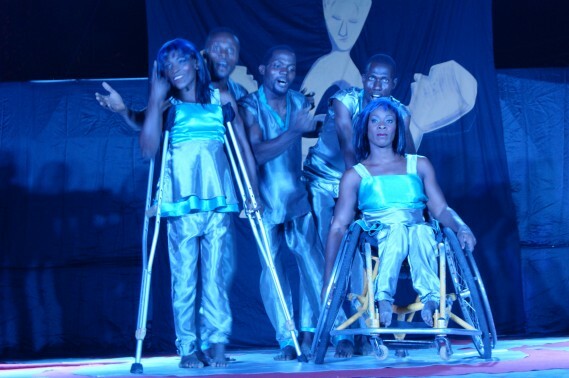 Choreographed by Frank Sam with support from Mark Lomotey, the three physically challenged and two able-bodied dancers appear to move in a cohesive but disjointed manner in spite of the high degree of harmonization that characterize the piece. Undeniably, they stay close to the floor as they flow from one scene to the other while contrasting their limbs. 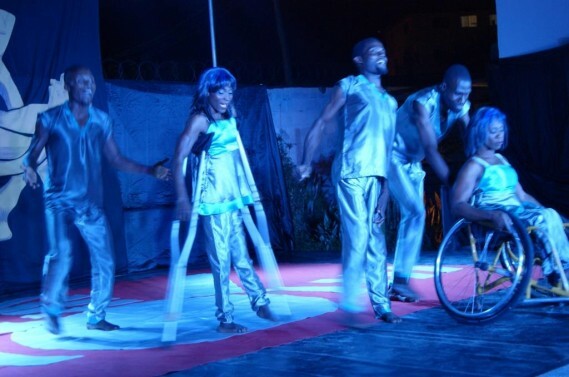 In the process, the physically challenged dancers create peculiar, geometric and sometimes odd movements that transform the human form into an incredible machine. 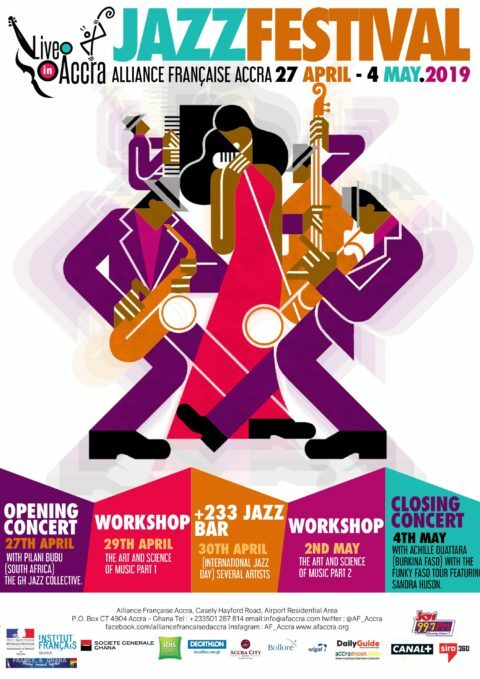 Accompanied by carefully selected music, the stage is engulfed with emotion as dancers struggled in the nonfigurative with expressions of love, peace and unity. Sequence after sequence effortlessly move into a series of undisturbed, calculated and symphonic movements thereby drawing cheers from the audience. 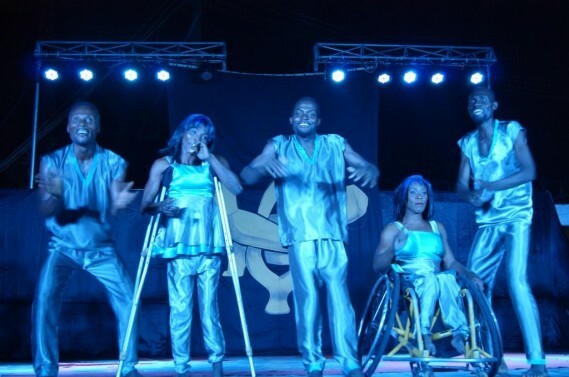 Sam allows all five performers absolute space to express themselves thereby ensuring equality on stage. 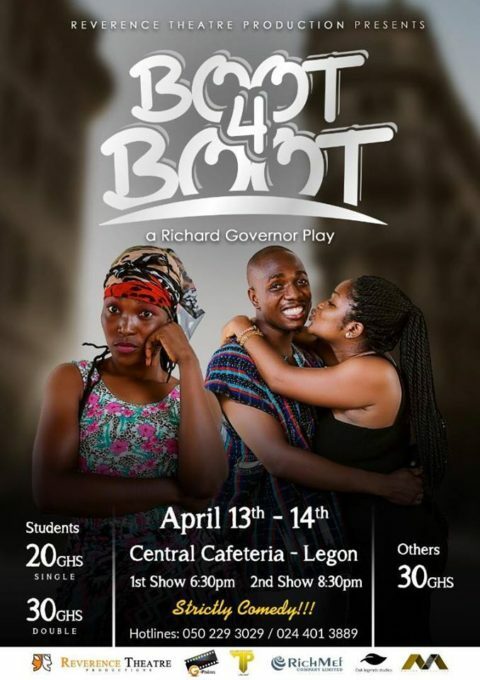 Indeed, refreshing solos and duets intersperse this suspense packed piece that is set to delight the eyes of Ghanaian dance lovers in some regional capitals. 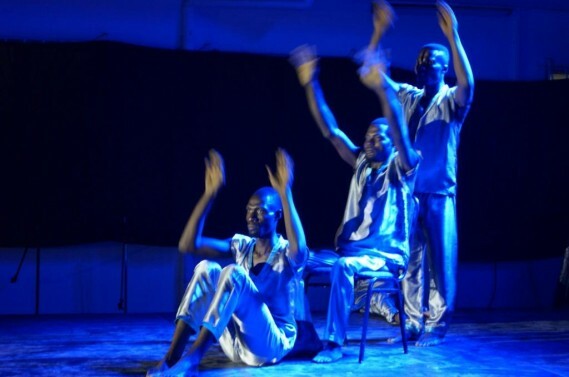 Despite problems with lighting, sound and editing, “Nkabom” is a piece with an enormous muscle capable of spreading the message of the physically challenged while encouraging further collaborations of this nature in the arts. 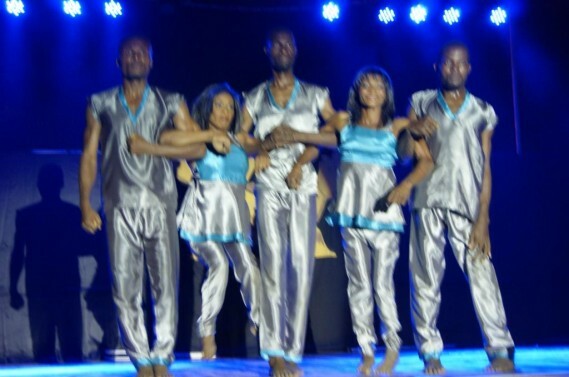 Earlier, the Tete Adehyemma Dance Theatre entertained the crowd with a hilarious dance drama titled “By The Road”, which deals with the story of a young man who decides to relocate to Europe by road and the consequences that befall him. 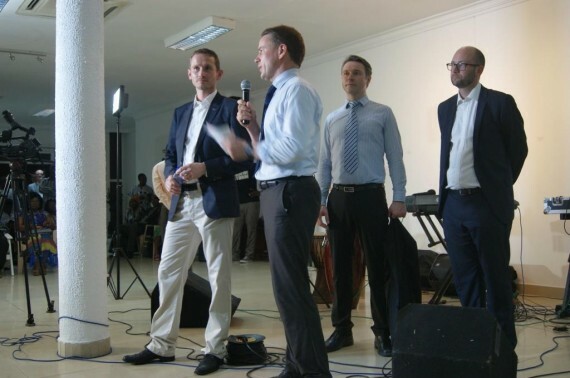 DANIDA, Ghana Denmark Cultural Fund, Danish Embassy in Accra, Accra Metropolitan Assembly, Goethe-Institut, British Council and the Alliance Française sponsored CAAF 2014, which was organized by the Institute for Music and Development. How the years fly when you are not counting! 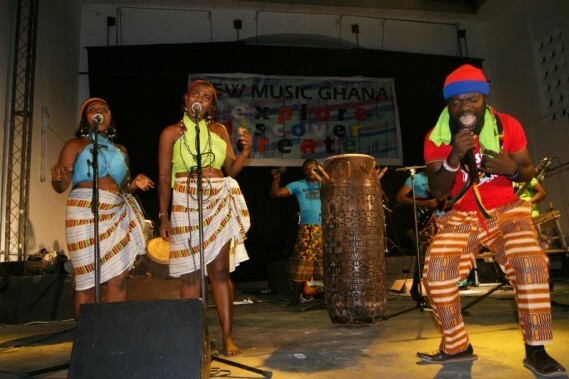 That was what went through my mind when I watched the Ghana Music Awards (GMA) on television last weekend. The style of music was different from what it used to be when live music performances, complete with instrumentalists, were in vogue. It looks like these days nobody cares about musical arrangements, melody and others anymore. 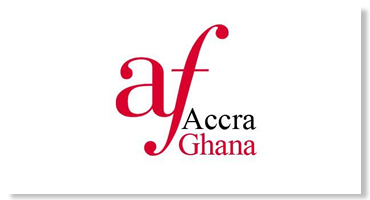 Gone are the days of the Entertainment Critics and Reviewers Association of Ghana (ECRAG), later renamed Arts Critics and Reviewers Association of Ghana (ACRAG), whose awards were based on solid professionalism. 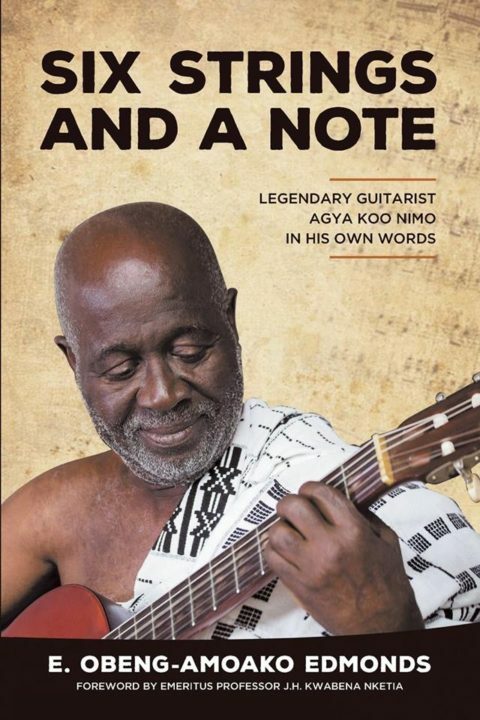 Among its award winners were Asabea Cropper, Gyedu Blay Ambolley, Amakye Dede and many other serious musicians like the late Kofi Ghanaba and the late King Bruce. Of course ECRAG awards were not limited to music alone. 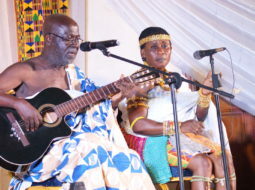 Some of its award winners in other categories of the arts were Professor Nii Yartey, Professor Atukwei Okai and Professor Emeritus J.H. 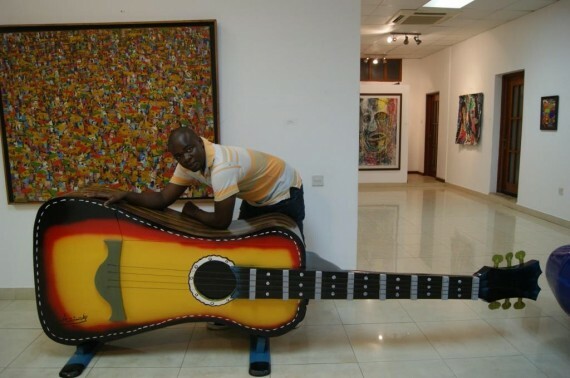 Kwabena Nketia. 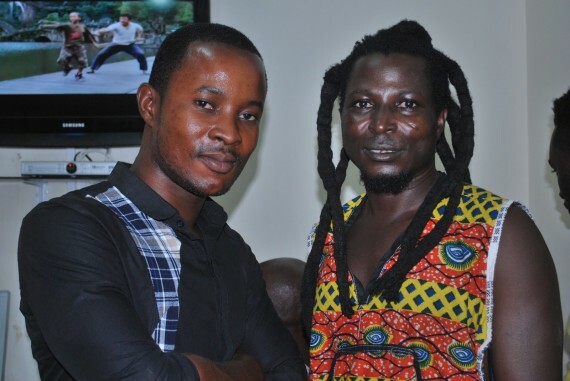 It seems only like yesterday when Chikinchee’s (real name is Gilbert Amartey Amarh) Let’s Do The Highlife album took this country by storm. The year was 1990. 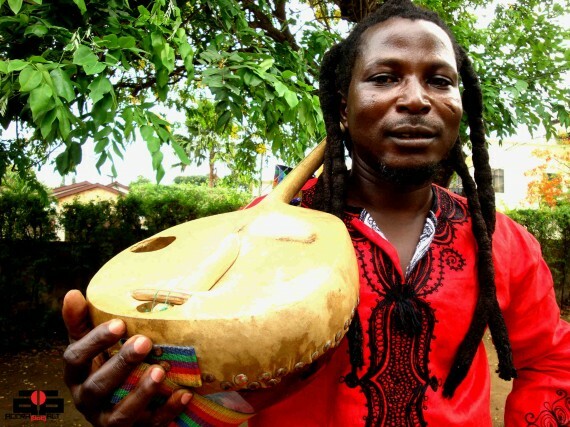 The hit singles Sakora Kose and Kese Menim from that album still bring back sweet memories even though many of the people I have heard singing those songs do not remember who the artiste credited with the songs is. 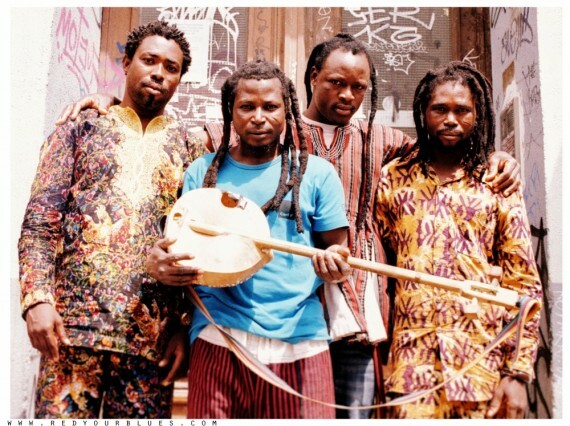 berA decade earlier, the late Faisal Helwani had put together a group of talented musicians who became known as Edikanfo and whose Roots Of Highlife album was such a sensation that it had the music of Ghana knocking loudly on the door of world fame. It is probably not for nothing that Edikanfo to this day remains the only band from this part of the world to have recorded with the world famous Fleetwood Mac! 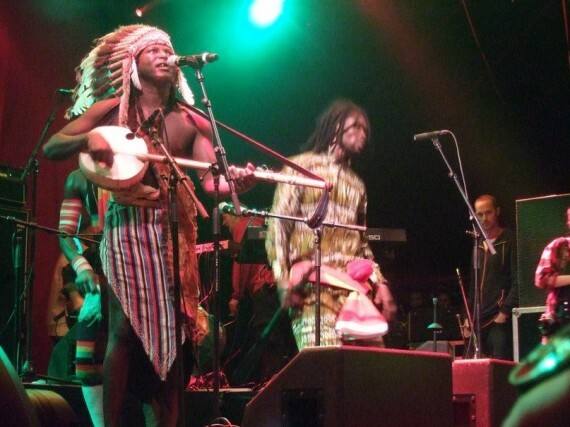 Those were the days when this country was awash with talented instrumentalists, singers and composers and they probably would have given to Ghana what Mori Kante and Salif Keita gave to Mali or what Youssou Ndour and Baaba Maal gave to Senegal if the coup detat of the last day of the year 1981 had not taken place. 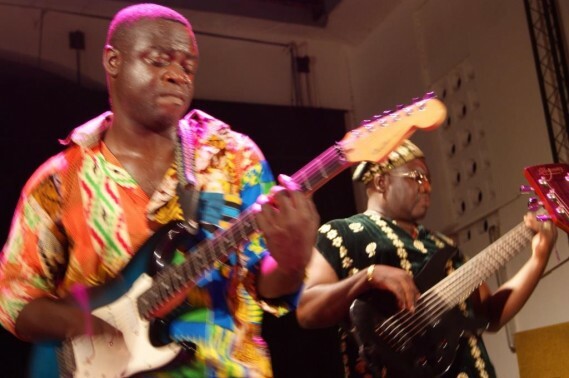 The years of curfew imposed on the country as a result of the coup made many of those talented musicians leave Ghana for greener pastures elsewhere since their trade is largely a night-time activity. For a large part of the decade that followed, this country saw a virtual absence of live band music and the introduction of what came to be known as spinning groups. 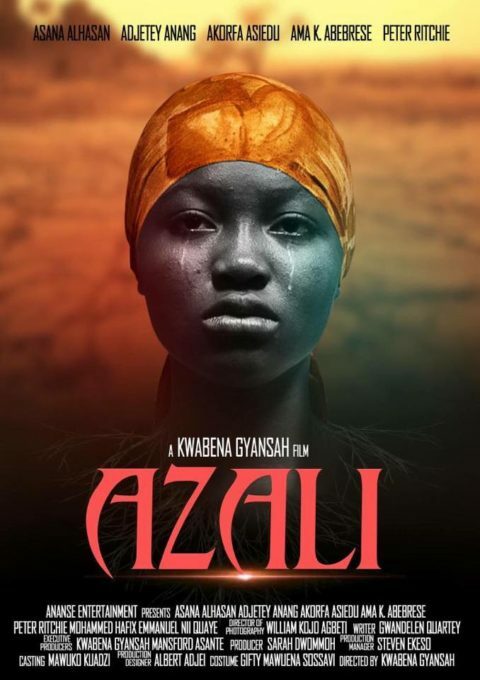 In my opinion this affected the quality of music that was offered even though some Ghanaian musicians living abroad tried to keep the Ghana flag flying in the world of serious music. 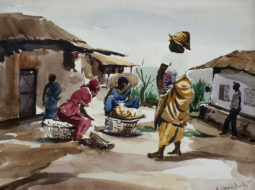 On the home front, this country saw compositions both secular and gospel, that clearly could not match internationally. The effect of this situation has been with us to this day. It is against this background that I find as useful any awards to encourage musicians to come up with good quality music. I did not see that last weekend. What I saw was the making of mediocrity a standard and honouring it. 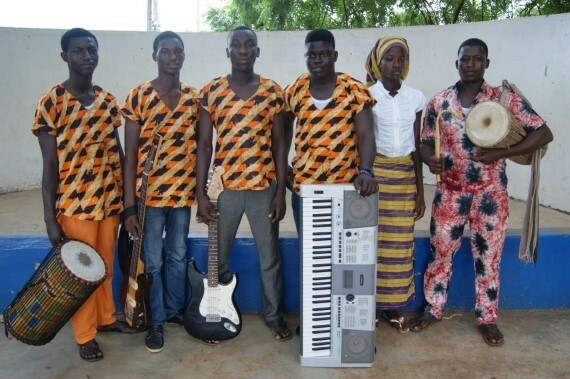 Sadly, many a young musician will be striving toward this mediocrity and the music of Ghana will be the loser. 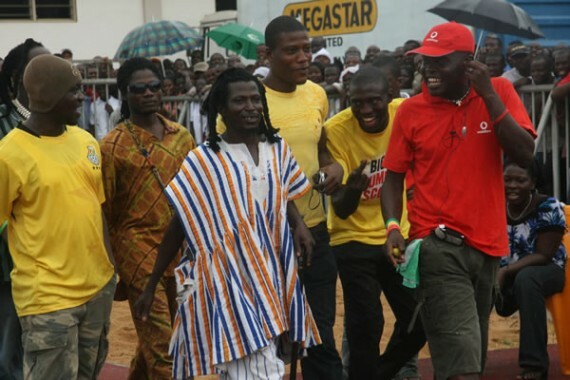 When ECRAG or ACRAG used to award artistes, and in spite of the many attacks it had to endure, one thing was certain: nobody quarrels with who is chosen as the Flagstar. 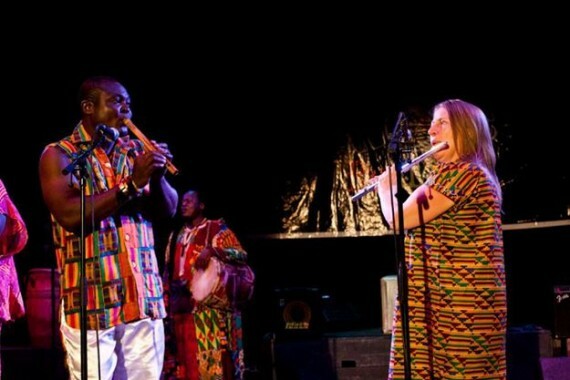 The Flagstar award, which was ECRAG’s highest award, was given to those who had lifted high the name of Ghana in the world of arts for a long time and were worthy cultural ambassadors for Ghana. 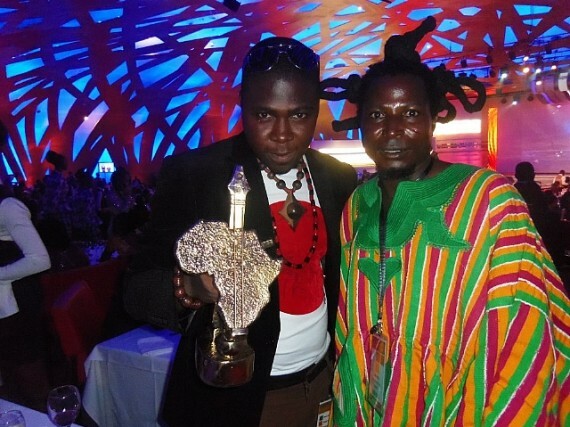 If the question be asked: what has the person who won the highest award last weekend done for the music of Ghana? Long before the awards night, there was what looked like a complete orchestration in the media to project an individual as the best among the lot. It was therefore, too much of a coincidence that the same individual became the eventual winner. Let us get serious in this country; music is serious business. 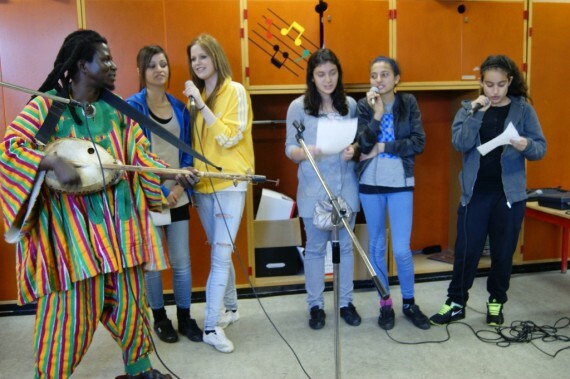 It was; the music of the Swedish group ABBA that at a point was the leading foreign exchange earner for Sweden. The same could be said of the music of the Beatles and what it did for Britain. 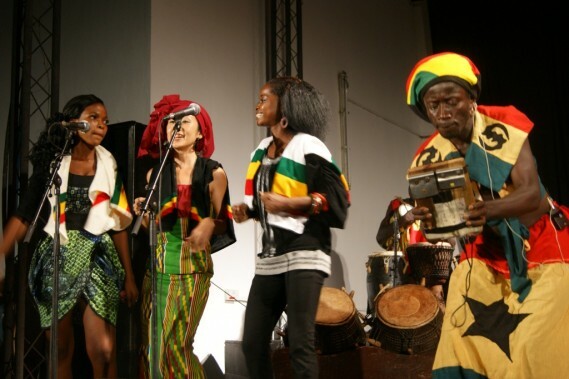 Again, it took the music of the late Bob Marley, Peter Tosh, Bunny Wailer and others to firmly plant the tiny island of Jamaica on the world music map and today reggae music has become international music. 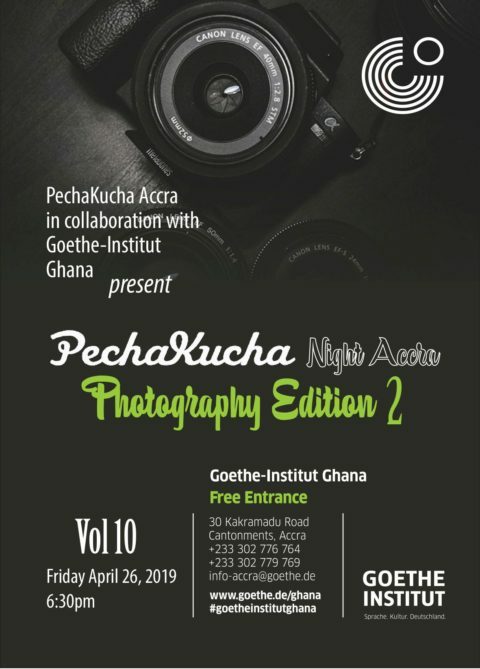 Ghana needs something similar and not some of the furious cacophonies that are receiving all the praise and which radio stations are bombarding us with. Have we forgotten that we still could listen to and learn from the vintage highlife music recorded by the likes of E.T. 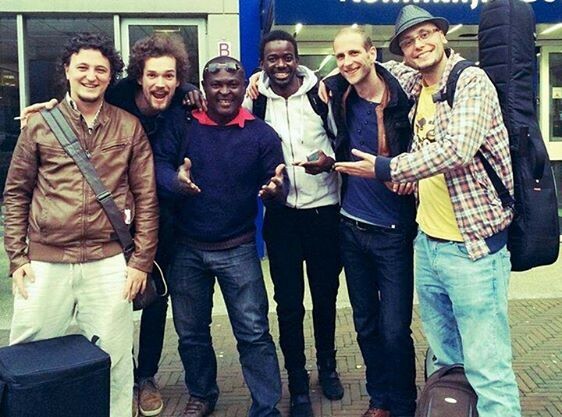 Mensah, King Bruce, Jerry Hansen, Uhuru Band, Sweet Beans, Sweet Talks, Kofi Ani Johnson, Hedzolleh and others? As I have stated above, music is serious business and we must begin to see it as such. 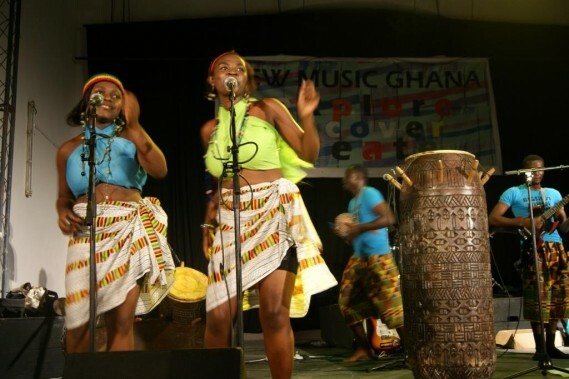 That is the reason why I like the New Music Ghana project and the effort to unearth talent for the enrichment of the music of Ghana. 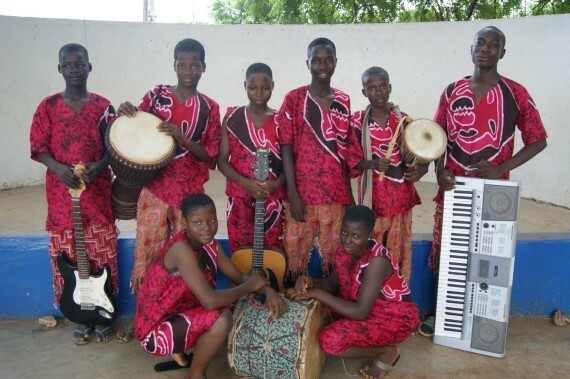 It is in these young and talented musicians in the various regions of Ghana that the future of this country’s music lies for they are the people who can break onto the international scene. 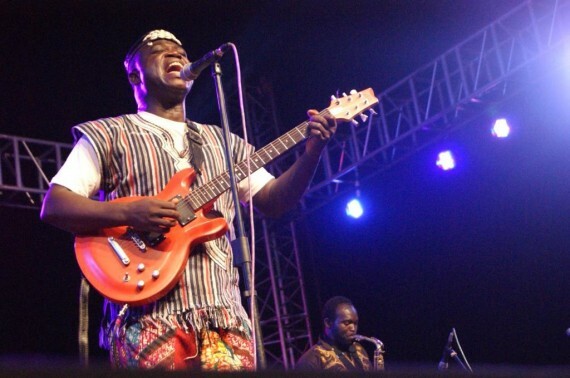 Australia based Ghanaian star Afro Moses and his O’jah Band will on Saturday March 8 perform at the Obra Spot (Kwame Nkrumah Circle) in Accra as part of activities marking the Celebrating Accra Arts Festival (CAAF). 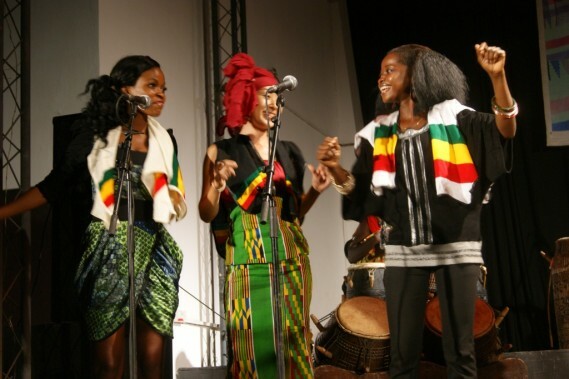 The concert, which will also mark the International Women’s Day, will feature Akablay and the Abiza Band, who have just returned from a performance tour of Denmark and other European countries. 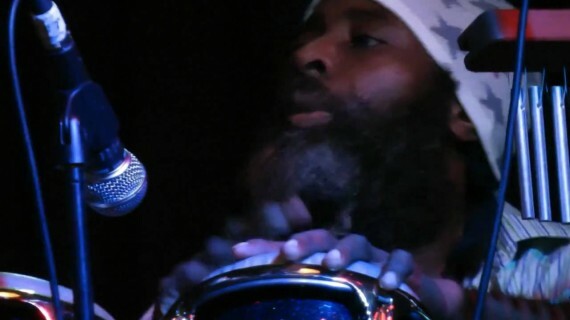 Formerly based in Denmark, Afro Moses is a singer, composer, multi- instrumentalist and teacher with a magnetic personality that has enchanted people alongside his high-energy music, powerful messages, showmanship and colourful stage shows. 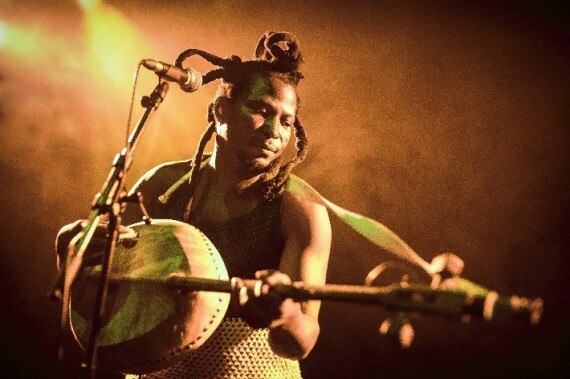 A multiple award winning musician, he has served music lovers all over the world with a tasty blend of Afro beats, reggae, funk, jazz, ragga, salsa, percussion, traditional vocals and much more. 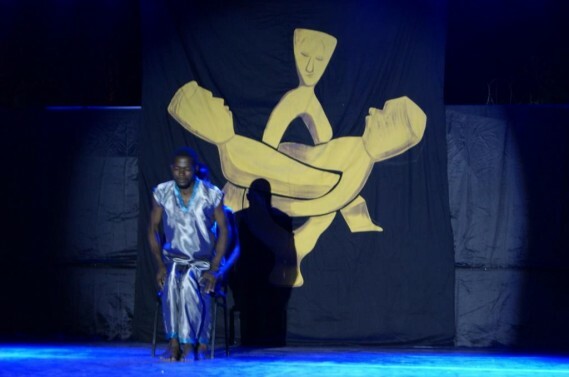 Moses, who is a natural performer, exhibits brilliant stagecraft that shines and keeps audiences at the edge of their seats. 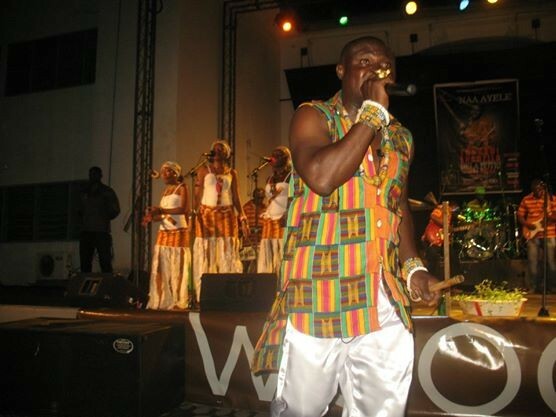 He is expected to woo fans who will troop to the Nkrumah Circle as well as people on transit. 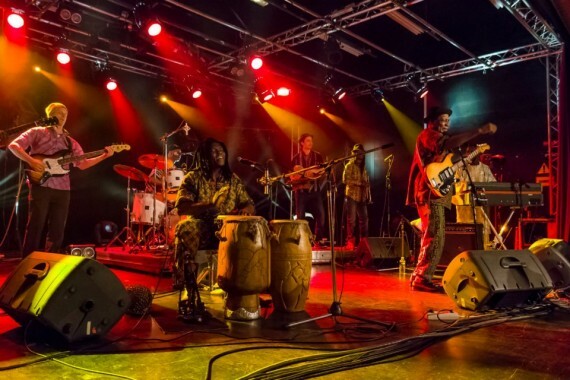 Led by Akablay, Abiza band will dish out a dramatic blend of Danish and Ghanaian rhythms that mesmerized audiences during their tour of Denmark in the summer of 2013. 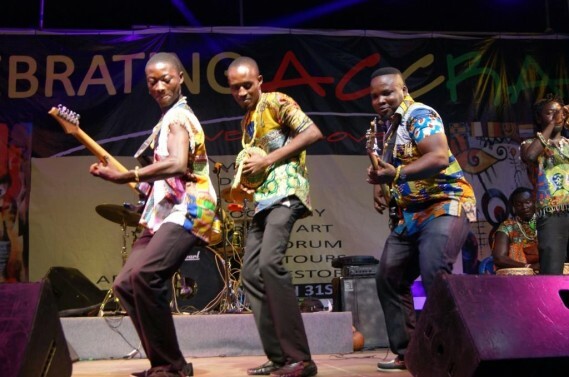 The group will showcase recent artistic creations that were composed and recorded in Denmark alongside Danish musicians while spicing the evening with rhythms from the Nzema area of the Western region. 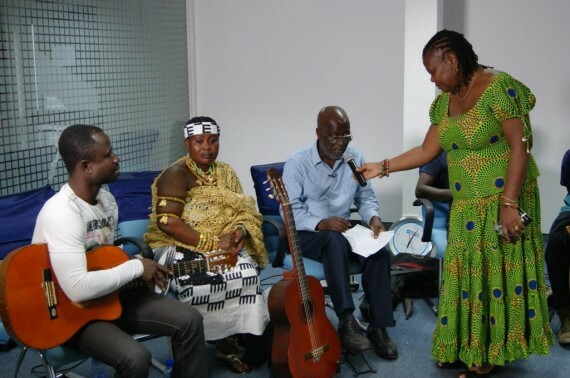 DANIDA, Ghana Denmark Cultural Fund, Royal Danish Embassy in Accra, Accra Metropolitan Assembly, Goethe-Institut, British Council and the Alliance Française are supporting CAAF 2014, which is being organized by the Institute for Music and Development. 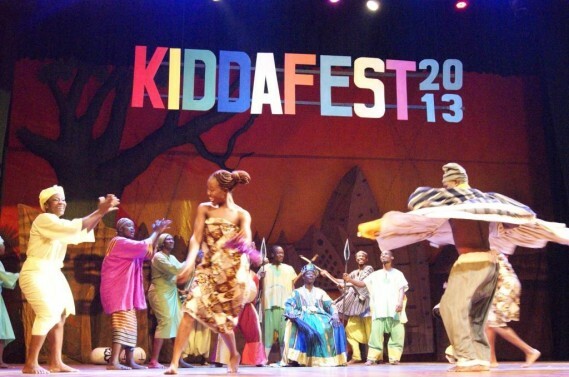 African Footprint International (Ghana) alongside Nafsi Acrobats (Kenya) recently received cheers from hundreds of kids during a brilliant performance at KIDDAFEST 2013 Festival. 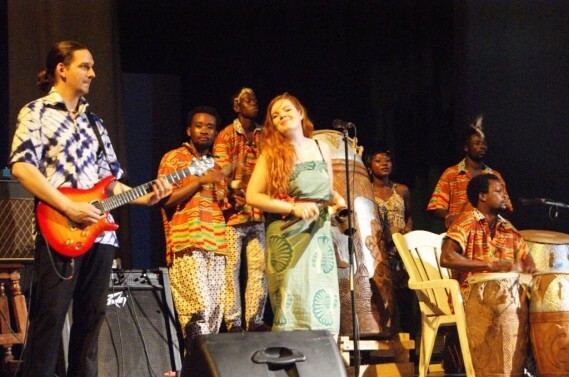 Performing at the National Theatre in Accra, the artistes, who are in Ghana with the support of the Ghana Denmark Cultural Fund, exhibited well-coordinated movements as well as amazing acts of equilibrium, dexterity and motor harmonization. 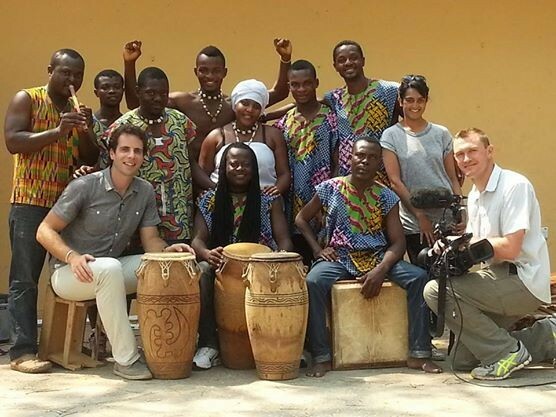 Accompanied by an assortment of traditional Ghanaian drumming, dancing and contemporary music, the group swayed the kids with a variety of deft maneuvers that left them completely astonished. Aerial dancers led by Esther Wrobel effectively utilized the vast expanse of space on the stage they “floated” on an apparatus attached to the ceiling thereby exploring space through three-dimensional tactics. 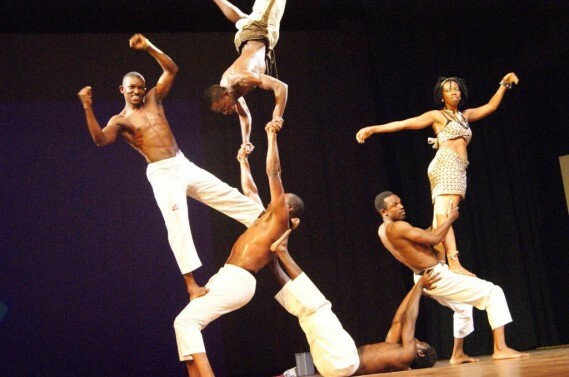 Led by Kennedy Nielsen Owino, the Kenyan acrobats exhibited extreme agility / dexterity as they flip-flopped, dived, jumped and rolled while Peter Kojo Amissah astounded the kids with tissue dancing. 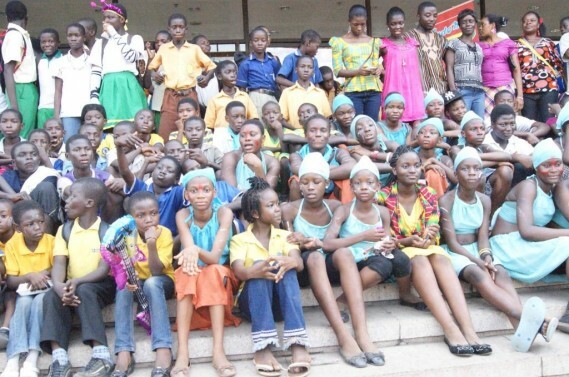 The National Dance Company, Theatre Players and the Symphony Orchestra equally took turns to entertain the kids, who also showcased their skills with several performances, dance competitions, poetry recitals, drama and carnivals. 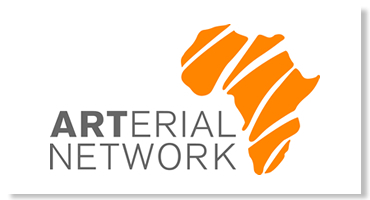 Based in Ghana and Denmark, African Footprint International comprises artistes from Ghana, Kenya, Denmark, Burkina Faso and Australia. 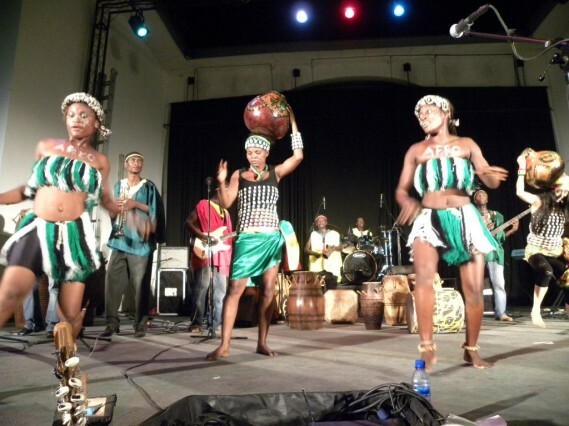 They have performed to enthusiastic audiences in several parts of Europe and the United States. 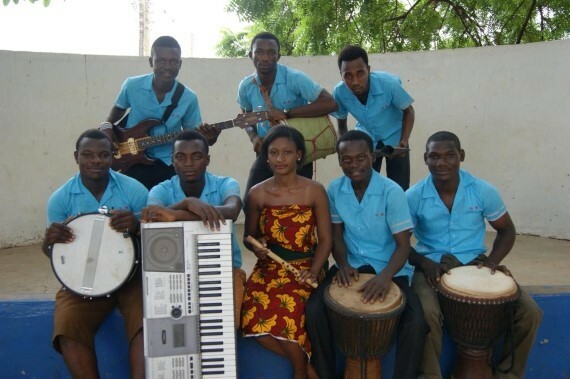 Blue Band, Cowbell, Fan Milk, Kalyppo, Goethe-Institut, E’toys and More, Crown Paint, Logistic Movers Dannex and the Institute for Music and Development partnered KIDDAFEST 2013, which attracted thousands of kids throughout Ghana.